Bodies in corridors, against-odds stand-offs, rogue agents, secret lairs and black helicopters. Richard Bruton of the Forbidden Planet weblog has stated that he loves Monsters’ cliches. While it’s not high concept, to call it unimaginative or derivative alone would be just unfair. Scribe Daniel Merlin Goodbrey long ago staked conceptual turf turning out interactive comics on infinite canvasses, a villain whose self-insight rivals comics theorist Scott McCloud, and a guy with a planet for a head. Some, like myself, would even accord Goodbrey the same status in concept progression as Kirby, Crumb or Moore. His established web-comics commonly explore genres of horror and hybrid western, and are joined here by the monster and spy thriller. Happy anomalies break through: a chicken-head giant with a chain-saw, the inverted and chained Statue of Liberty and other idea gifts, or Merlisms. Fun? Yeah, more than a bit. The protagonists as we know them seem softer than the ‘monster police monsters’ description given. In the case of the protagonists they’re as much ‘cop monsters’ as taking out bad guys out of altruistic motive. Certainly in the cases of Charlotte Hatred, a haunter of mirrors, and dream stalker Creeping Tuesday their positive humanity is prevalent. In some traits displayed by Jonathon Gravehouse and antagonist Thomas Harp, opposing rogue Watchers Council sorts, they both look human and can come across as not such bad blokes. Apart from the odd bit of within narrative slavery, murder, if you like that sort of thing. The cast is rounded off by downright dirty psycho-paths in the best Krueger/Jason traditions, gimp-masked Cowboy 13 and his arch nemesis, Chicken-Neck. The four members of The Chain are bound together by a chain, networky implants placing them under the organisation’s will and the story concerns Harp’s challenge to their authority. Which is all I’m going to tell you of the plot, because the soul of the series is in the journey, not laminated card battle stats inside some ludicrously priced board game. This is much harder to write than it is to read you know. Yes, Monsters’ attributes with Goodbrey’s other works appear. Traceable attributes are far-off from the most well-known output of artist Sean Azzopardi and that is Twelve Hour Shift. A graphic novel about Ed Someone, a night porter struggling to overcome the ritual working and draw his first graphic novel. This sounds a bit boring, which is just how real Shift’s recounting going through the motions is. Balancing the frustration, there’s quiet insights which excel alongside the artist’s poetic reflection and his draughtsmanship of tender visuals. Yet in Monsters’ the cinema is strong directed Western box office to the point were you can hear the grinding of chain-saws and blood spattered over your face while the local cult building spontaneously erupts in flames and your children bang on your windows with hedgehogs over and over until lamps and bookcases where you are sitting fall over. 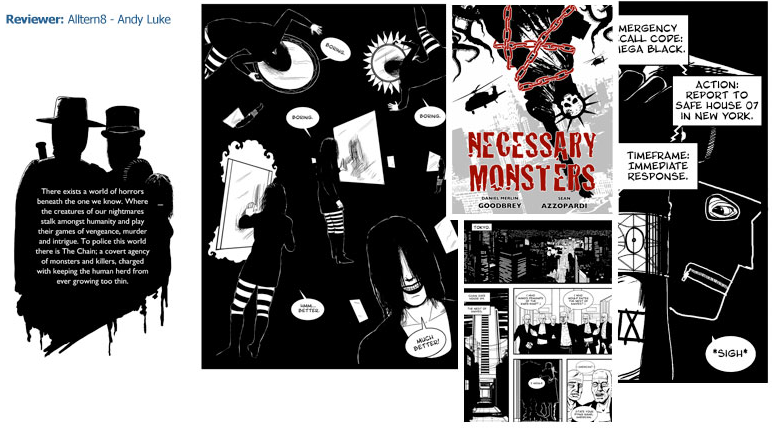 Necessary Monsters is released in collected edition by ATR/Planet LAR “including updated artwork across all five chapters and a brand new introduction by Kieron Gillen (Phonogram, S.W.O.R.D, Thor)” (One of these re-workings is the introductory visual at the head of this article) It goes out to comic shops in February for $12.95 US and you can be helped to track it sitting down or standing right now with Diamond order code DEC09 0641. It’s also available to order via Forbidden Planet in the UK and via Amazon in the States. 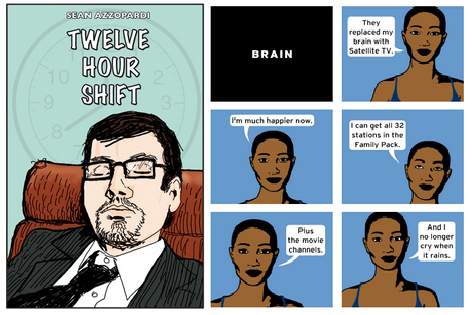 Twelve Hour Shift can be purchased through Sean’s website, Phatcatz.org.uk for the bargain price £6.95 + £2.00 postage.